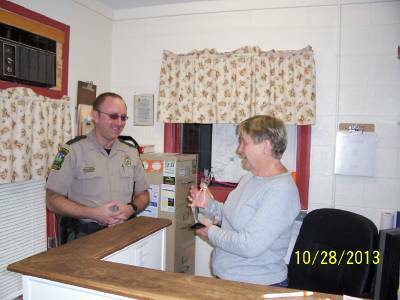 Amelia County Animal Control Officer Brian Wootton and Amelia County Animal Shelter Administrative Assistant/APAW Vice President Cindy Case show off the new Old Hickory storage shed that APAW recently donated to the Amelia County Animal Shelter. 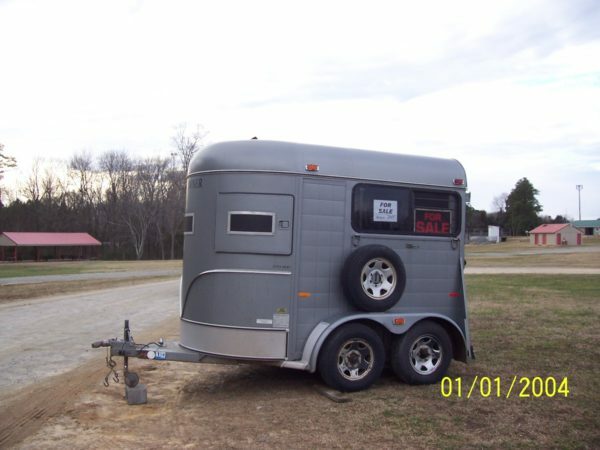 APAW originally donated a similar storage shed to the shelter in 2007 for the storage of equipment and supplies to free up valuable space for animals in the shelter. 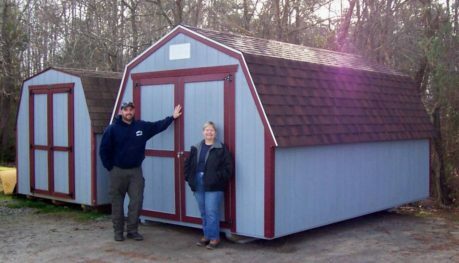 Upon learning that the shelter was once again cramped for space, APAW purchased an additional storage shed from 360 Sheds & Outdoor Buildings in Amelia, owned and operated by Rik & Stephanie Maybee. When they discovered that APAW was donating the shed to the animal shelter, the Maybees included their own donation to help with the purchase of the shed. The shed was designed to match the one previously purchased by APAW and was manufactured by the same company. 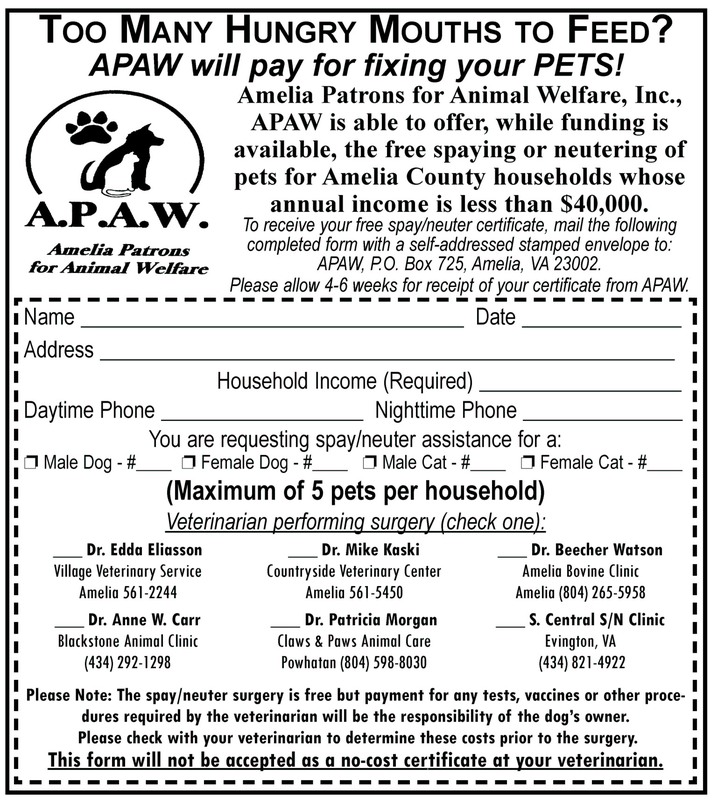 Under this new APAW program, low income Amelia County residents can have their pet spayed or neutered for only $5.00 with proof of financial need (no additional veterinary fees required). 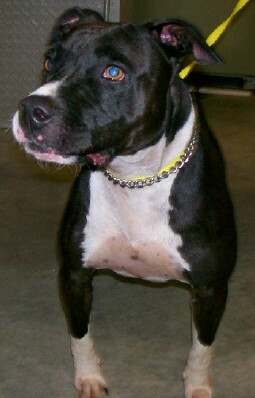 Client will pay veterinarian $5.00 at time of surgery. Amelia County Animal Control Administrative Assistant and current Amelia Patrons for Animal Welfare, Inc. President (APAW) Cindy Case received yet another award for her life-saving efforts for the homeless dogs and cats from the Amelia area at the 2015 Virginia Federation of Humane Societies (VFHS) annual conference. 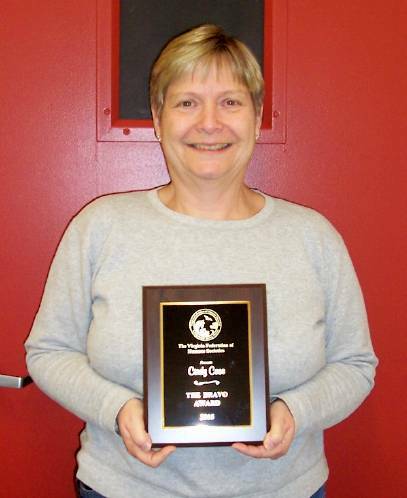 Cindy received the VFHS BRAVO award at the conference held in Fredricksburg on Friday, March 20th. The BRAVO award was established in 1992 by former VFHS President Elizabeth Sills to recognize an individual who has demonstrated a commitment of outstanding service to promote animal welfare, who has been instrumental in making an impact within an animal welfare organization, and who is a reflection of the values and standards set forth by the Virginia Federation of Humane Societies. The VFHS is a membership organization that was founded in 1959 with the primary goals of addressing the issues of animal cruelty and pet overpopulation within the Commonwealth of Virginia and to foster humane attitudes through education. Nominated by Amelia County Animal Control Officer Brian Wootton and selected by her peers in the animal rescue arena, Cindy was chosen because of her tireless and selfless dedication to saving the lives of lost, abandoned and stray pets. Congratulations Cindy! To adopt a new pet or help Cindy in her efforts, contact the Amelia County Animal Shelter at 561-3878 or amelianimalshelter@ameliacova.com. Bull Terriers named Christopher and Cocoa from the Amelia County Animal Shelter to fly to a rescue organization in New York where they will get a second chance at finding a forever home. Thanks to the generosity of pilots and plane owners, homeless animals in shelters all over the United States are receiving this second chance by being flown from areas with too many pets to places where there are new homes waiting to welcome them. 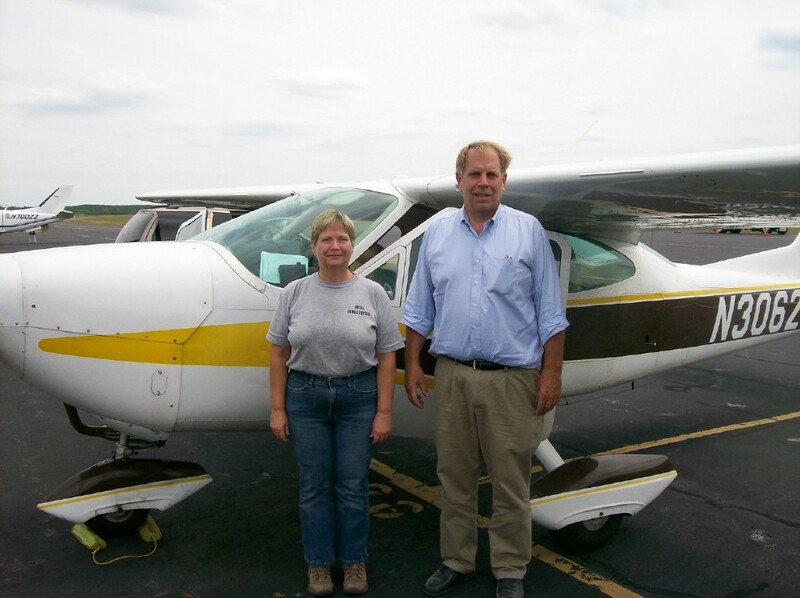 Recent Virginia Animal Control Officer’s Association Presidential award winner Cindy Case, (who is also the Amelia County Animal Control Administrative Assistant and an APAW member), coordinated with Horseheads Animal Shelter in Horseheads, New York, who agreed to rescue the 2 dogs and two generous pilots from Hagerstown, MD, who agreed to fly the dogs to New York. So on Wednesday, July 16th, Cindy delivered Christopher and Cocoa to the Chesterfield County airport where she loaded them on the airplane with Bob & Tom and sent them off on their new adventure! Christopher and Cocoa are the 5th and 6th dogs from the Amelia County Animal Shelter to be flown to other states for a new home through the Pilots N Paws program. On December 12, 2009, Huckleberry the homeless Hound was the first dog to fly from Chesterfield to Ohio, and on June 20, 2010, Tony the homeless Hound became the second recipient of a flight from Lynchburg to Ohio. Then in July 2012, Mr. Spots was flown from the Chesterfiled airport to Lumbertown, NC, where he continued his journey by ground to a rescue in Florida, followed by Milly, the Beagle, who flew from the Chesterfield airport to a Beagle rescue in NJ in October 2013. 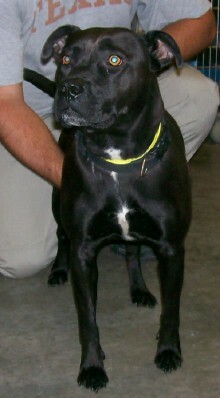 More information on this exciting animal rescue program can be found at www.pilotsnpaws.org. which is intended to be a meeting place for those who rescue, shelter or foster animals, and pilots and plane owners willing to assist with the transportation of animals. The animals available for adoption from the Amelia County Animal Shelter can be viewed at www.petfinder.org/shelters.VA73.html.